Following the long promenade of Uvala Lapad (The Bay of Lapad) with bars, cafe's and restaurants, you'll reach several popular beaches with facilities such as bars and restaurants, rental of parasols and deck chairs as well as a volleyball and soccer field. Uvala Lapad is a great choice if you are on vacation with children as the sea is quite shallow and in the surrounding area you will also find a children's playground, inflatable bouncers and and similar. You can easily find a spot on one of the few beaches, of course, the further you walk the less crowded it will be. There are several hotels and apartments around Lapad Bay in Dubrovnik. The picturesque island of Lopud is reachable by a daily ferry leaving from Gruz harbor and is a must visit if you have a gap in your itinerary. Although it features a few hotels (one of them being a true 5* island resort), it is still a charming small /fisherman's settlement/with beautiful natural scenery, sandy beaches and coastal walks. The town of Lopud istelf features a few sandy beaches as well, but a 20 minute walk away, on the southern side of the island lies Sunj beach, one of Dubrovnik's most popular beaches. It's a sandy and (very) shallow beach (you'll need to walk up to a 100 meters in order to get deep enough to swim) so it is also a good choice for families on holiday with their kids. Here's some advice you'll appreciate: there's no traffic on the island but you can get to the other side with one of the golf carts used for the purpose. It doesn't cost much but you will save some time...and energy. 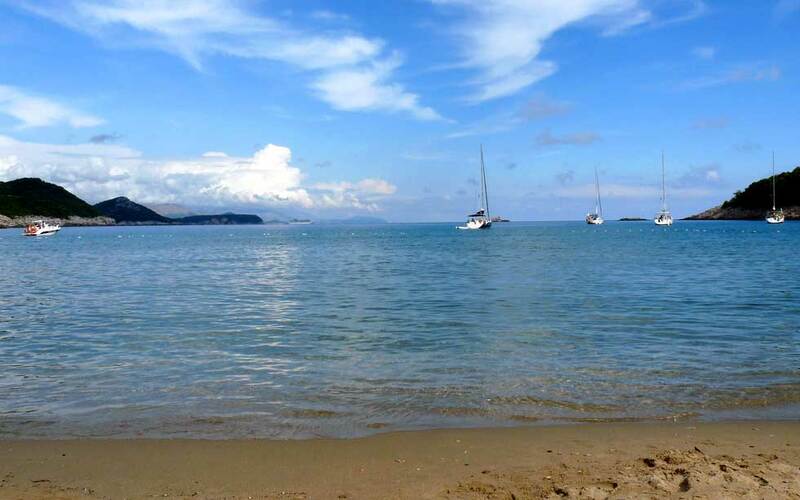 Check out great savings on hotels and apartments on Lopud Island. Kolocep is the second Elaphite island and also easy accessible by ferry or transfer boats. It is a untouched green oasis with ancient pine forests, carob, olive groves and gardens full of oranges and lemons. If you find Lopud a bit to popular and believe it will be crowded, Kolocep is a great alternative. The beach of Kolocep is located in the town of Gornje Celo in front of a newly renovated resort. With more than 250 sunny days, Kolocep is a very desirable tourist destination + it only takes about 20 minutes to reach it. Check out great savings on hotels and apartments on Koločep (Kalamota) Island. About 10 kilometres to the south, in the so called Zupa Dubrovacka (Parish of Dubrovnik - actually a village cluster so to say) there are several options when looking for a nice beach. Beside the beautiful Kupari area (beaches surrounded with in the war devastated and not yet rebuilt hotels) you can enjoy a day in Srebreno. Several beaches with a nice waterfrint full of cafe's, bars and parks suitable for children. This is a great place for a peaceful and quite vacation away from the everyday hustle. You can reach both areas buy bus nr. 10 from Dubrovnik. Kupari and Srebreno are connected with a path so you can take a nice relaxing walk and explore the area. Chances you find a secluded cove or "1-person beach" between the rocks are high!. Check out great savings on hotels and apartments in Srebreno. Saplunara bay and the lagoon Blace are located on the south-eastern tip of Mljet island. Saplunara is located on the south-east side of the island of Mljet. Saplunara bay is about a kilometre long surrounded by a thick pine forest. Its name derives from the Greek word sabulum, meaning sand. The two beautiful beaches, called the Large and Small Saplunara can reach a sea temperature of 28°C in the summer! Blace, also known as "Limuni" is a lagoon-like bay not far from Saplunara. It is a perfect example of intact nature and one of many hidden gems of Croatia. You can reach it either on foot or by car (the roads on Mljet are scenic but not well maintained so drive carefully, yet, no need to panic). There are no beach bars on either so be sure to bring plenty of water with you. Check out great savings on hotels and apartments on Mljet Island.